Clyne, Geraldine, illus. 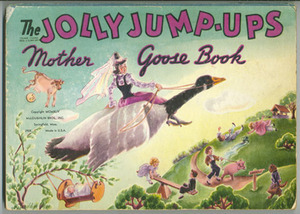 The Jolly Jump-Ups Mother Goose Book. Springfield: McLoughlin, 1944. When we look at "Hey, diddle, diddle," there seem to be no worries about how and where a complacent-looking rubber-legged cow might land. Here peace reigns, and even the elopement of the gentlemanly dish and the elegant spoon has a quiet, self-contained air. Clyne, Geraldine, illus. 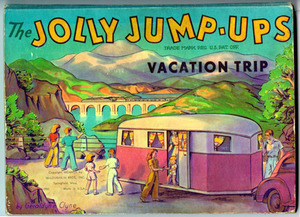 The Jolly Jump-Ups Vacation Trip. Springfield: McLoughlin, 1942. Produced during the war years, this book shows the Jump-Ups' vacation as a series of stops at military schools, the White House, and similar sites which reinforce American power in the face of adversity. Even the outdoor scene of camping is filled with nationalistic imagery: large flags, a sense of purpose, team spirit, and determination. Clyne, Geraldine, illus. 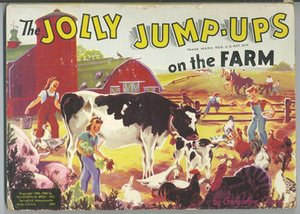 The Jolly Jump-Ups on the Farm. Springfield: McLoughlin, 1948. Distancing themselves from the Dust Bowl and Depression years, these farm scenes endorse American agrarian ideals. Every page turn of this pop-up book affirms the core values of the American farmer--hard work, honest effort, noble purpose, and productivity. The book celebrates the strength of the American economy in the years following World War II. Clyne, Geraldine, illus. 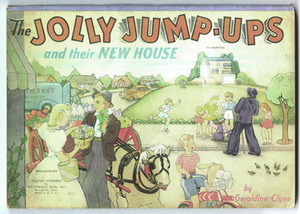 The Jolly Jump-Ups and Their New House. Springfield: McLoughlin, 1939. The modern 1930s home housed not only a family but a lifestyle. Its streamlined elegance, pastel colors, and new appliances spoke to and anticipated future affluence. Here the nuclear family became the center of the narrative, shaping and shaped by its walls. The Jump-Ups on the steps of their new home serve as exemplary models of this promise, no doubt convincing many a young reader that the ultimate in fine living and fulfillment was one move away.